THE FIFTH DIVISION OF THE TUAT. [paragraph continues] Ra, "RA-HERU-KHUTI unfoldeth our doors, and openeth our gateways. Hail, Ra, come thou to us, O great god, lord of hidden nature." 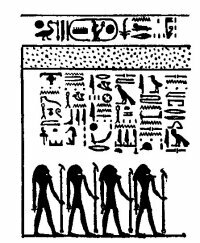 The monster serpent which stands on his tail and guards the gateway is called TEKA-HRA, and the two lines of text which refer to his admission of Ra read:--"He who is over this door openeth to Ra. SA saith to TEKA-HRA:--'Open thy gate to Ra, unfold thy doors to KHUTI, that he may send light into the thick darkness, and may make his radiance illumine the hidden habitation.' This door is shut after the great god hath passed through it, and there is lamentation to those who are in this gateway when they hear this door close upon them." As the hieroglyphic text is identical with that given above on p. 120 it is not repeated here. The Gate of the serpent Teka-hra. The Boat of Ra being towed by the Gods of the Fifth Division of the Tuat. The Nine Gods who hold Ennutchi. you guard, protect that which cometh into being from my forms, and tie ye up (or, fetter) that which cometh into being from my strength.' Their food consisteth of the hearing of the word of this god, and offerings are made to them from the hearing of the word of Ra in the Tuat." 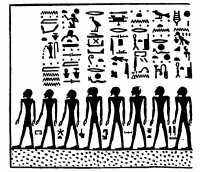 (far Left) Heri-qenbet-f. (Right) The souls of men who are in the Tuat. god HETEPI, according to what should be offered unto them." Ra saith unto this god:--"Let him that is over his Corner (HERI-QENBET-F) cry out to those souls who are right, and true, and divine, and make them to sit at peace in their habitations at the Corner of those who are with myself." On the right hand of the path of Ra in the Fifth Division of the Tuat are:--1. Twelve male beings bowing in adoration; they are described as "those who make adorations in the Tuat." 2. 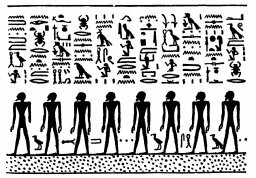 Twelve male beings who bear in their hands a cord for measuring plots of ground and estates; these are called "Holders of the cord in the Tuat." Four gods, standing upright, each holding the symbol of life in his right hand, and a sceptre in the left. The Twelve Gods who make adoration in the Tuat. The Twelve Gods who hold the cord for measuring land. of Ra, and their drink is of his tcheser drink, and their libations are made of cool water, and offerings are made unto them on the earth in [return] for the praisings which they make unto Ra in Ament." 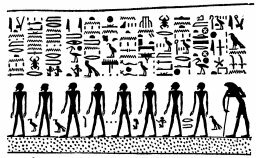 them]:--'Take ye the cord, draw it tight, and mark out the limit (or, passage) of the fields of Amentet, the KHU whereof are in your abodes, and the gods whereof are on your thrones.' The KHU of NETERTI are in the Field of Peace, [and] each KHU hath been judged by him that is in the cord. 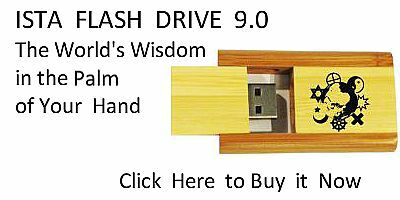 Righteousness is to those who are (i.e., who exist), and unrighteousness to those who are not. Ra saith unto them:--'What is right is the cord in Ament, and Ra is content with the stretching (or, drawing) of the same. Your possessions are yours, O ye gods, your homesteads are yours, O ye KHU. Behold ye, Ra maketh (or, worketh) your fields, and he commandeth on your behalf that there may be sand (?) with you." "Hail, journey on, O KHUTI, for verily the gods are content with that which they possess, and the KHU are content with their homesteads. Their food [cometh] from Sekhet-Aru, and their offerings from that which springeth up therein. Offerings are made unto them upon earth from the estate of Sekhet-Aru." measured in Sekhet-Aaru. Let them give fields and sand to the gods and to the souls who are in the Tuat. Their food shall be from Sekhet-Aaru, and their offerings from the things which spring forth therein]." The Aamu, i.e., Asiatics. The Reth, i.e., Egyptians. (far right) Horus. The Themehu, i.e., Libyans. The Nehesu, i.e., Negroes. name of NEHESU (i.e., Negroes); Horus made them to come into being, and it is he who avengeth their souls. I sought out mine Eye, and ye came into being in your name of THEMEHU; Sekhet hath created them, and she avengeth their souls." The Twelve Gods of Life in Ament. to the place of destruction which ye are commanded to appoint, and let them not see the hidden place." The Eight sovereign Chiefs in the Tuat. 157:1 Supplied from Champollion, Notices, p. 772. Next: Chapter VII. The Judgment Hall of Osiris. The Sixth Division of the Tuat.